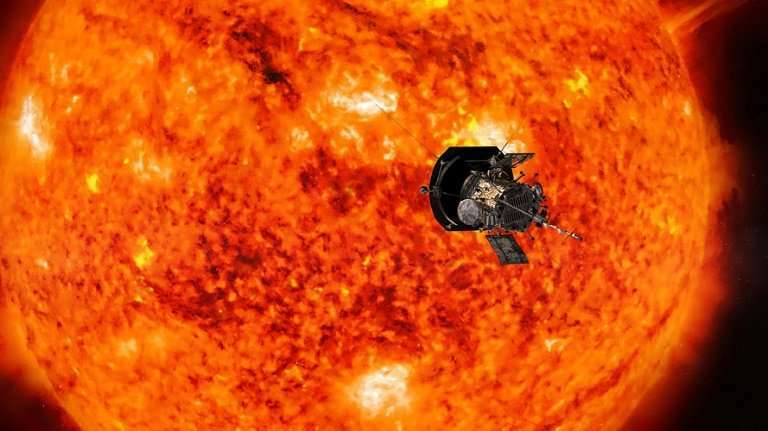 After the Parker Solar Probe blasts off from Cape Canaveral, Florida on August 11, it will become the first spacecraft ever to fly through the Sun's scorching atmosphere, known as the corona. Understanding how the corona works will help scientists anticipate dangerous space weather storms, which can disrupt the power grid on Earth. "It's of fundamental importance for us to be able to predict space weather much the way we predict weather on Earth," explained Alex Young, a solar scientist at NASA. The corona is a "very strange, unfamiliar environment for us." The unmanned probe is named after Eugene Parker, the 91-year-old pioneering solar astrophysicist, and the US space agency has coined it as the first mission to "touch the Sun." Mission managers say that may sound like a lot but is really quite a close shave, given the sweltering conditions out there. The Sun-facing side of the probe will endure temperatures of about 2,500 degrees Fahrenheit (1,370 Celsius). 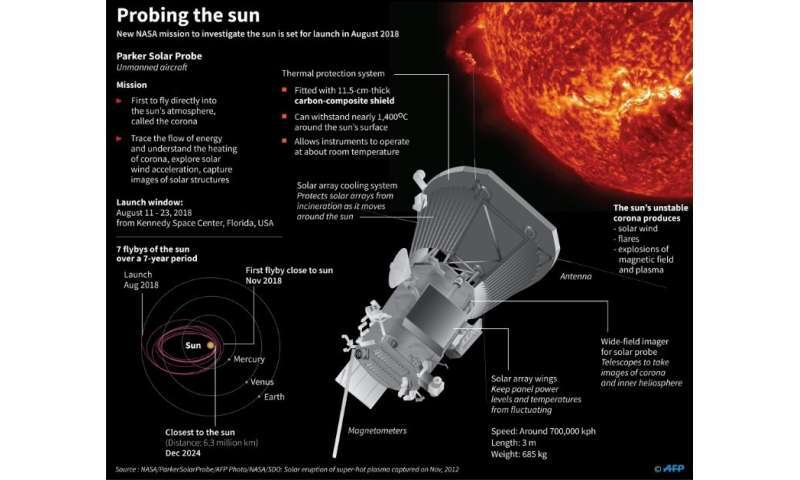 Graphic on the Parker Solar Probe, which will become the first spacecraft to fly directly into the sun's atmosphere, with a launch window of August 11-23. 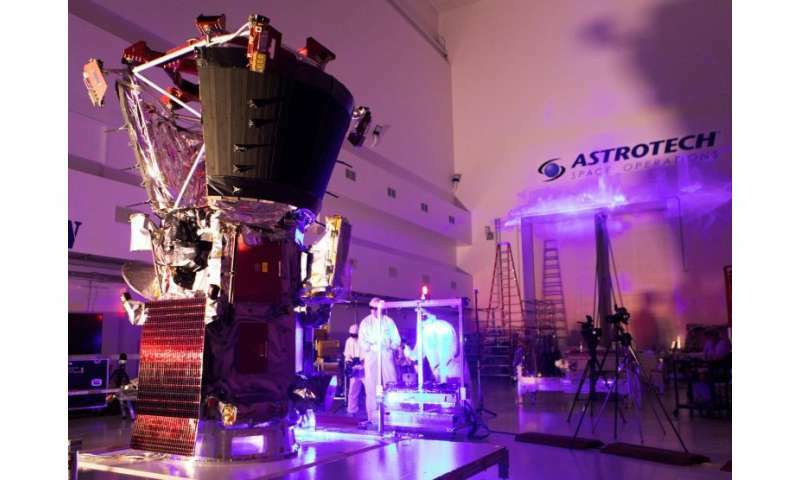 The spacecraft is protected by a heat shield that will keep it closer to room temperature, about 85 degrees Fahrenheit. Speeding by at a pace of 430,000 miles per hour will make it "the fastest human-made object," said project scientist Nicky Fox of the Johns Hopkins University Applied Physics Lab. Over the course of its seven year mission, the spacecraft aims to pass through the corona 24 times, which Fox said makes for an "incredibly daring journey." Unlike a campfire, which feels hottest at the source, the heat from the Sun gets more intense further away from its surface. "As we go from the surface of the Sun, which is 10,000 degrees Fahrenheit, and move up into the corona, we find ourselves quickly at millions of degrees," he said. NASA calls this mismatch "the coronal heating problem," and hopes the Parker Solar Probe will solve the mystery of why the corona reaches temperatures of up to 10 million degrees Fahrenheit. Fox said scientists have already studied the corona "every way imaginable," and a closer look is now needed. "We need to get into this action region, where all of these mysteries are actually occurring." The probe is protected by a 4.5-inch-thick (11.43-centimeter) carbon-composite shield, built to withstand 500 times the Sun's radiation on Earth. A series of instruments on board the spacecraft will measure the magnetic and electric fields, plasma waves and high energy particles. There is also a white light imager, taking pictures of what the spacecraft is about to "plow through," said Fox. "The goal is to have the instruments on all the time but the prime science gathering for us is about 11 days," she told reporters ahead of the launch. A 45-minute launch window opens on Saturday at 3:48 am (0748 GMT). Awaiting liftoff, the car-sized probe is already packed on to the Delta IV-Heavy rocket at Cape Canaveral Air Force Station in Florida.